Charles and Astrid in a photo by Maria. 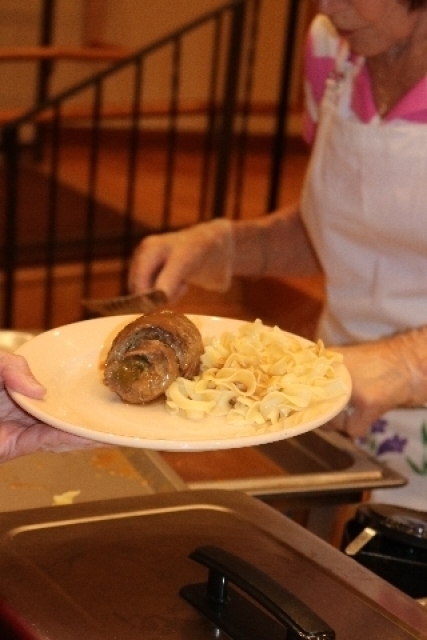 The cook serving her homemade rouladen. 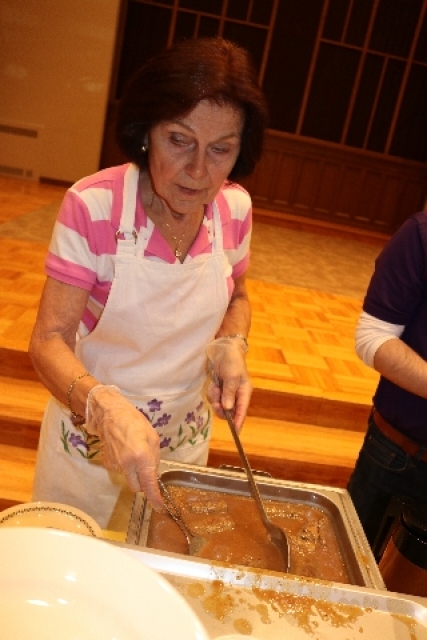 Gravy to top the noodles. 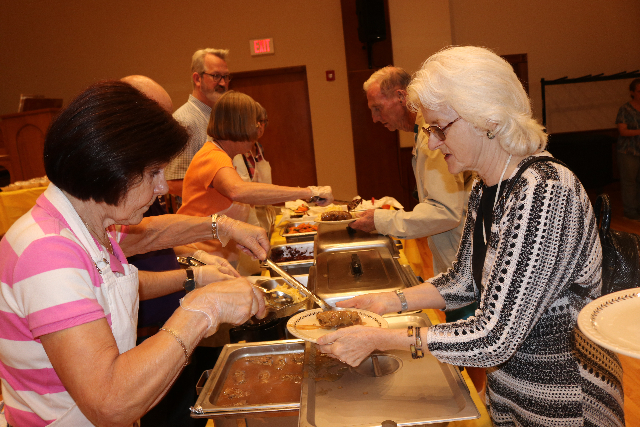 Lutherans enjoying a communal meal. 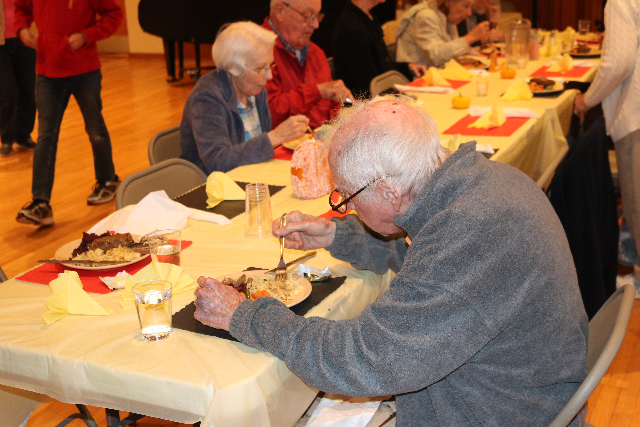 Pastor Tim enjoyed a successful event. 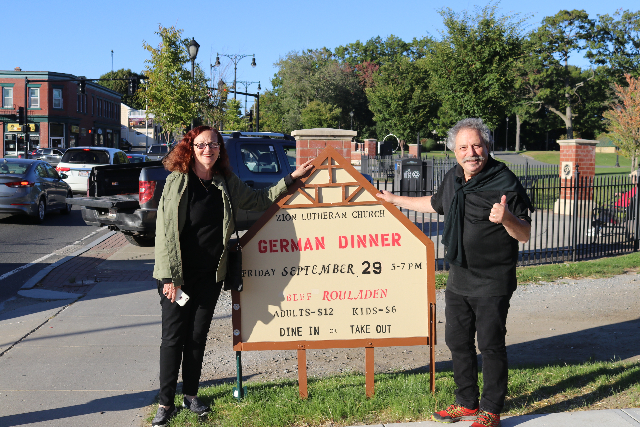 Last night we enjoyed a fabulous German dinner with 200 or so other celebrants at Zion Lutheran Church in Pittsfield. 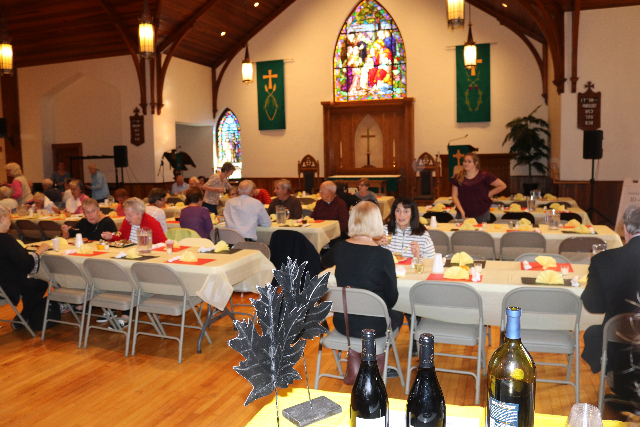 Our friends, Phil Kampe and Maria Reveley, travel, food and wine writers for Berkshire Fine Arts, invited us to join them. 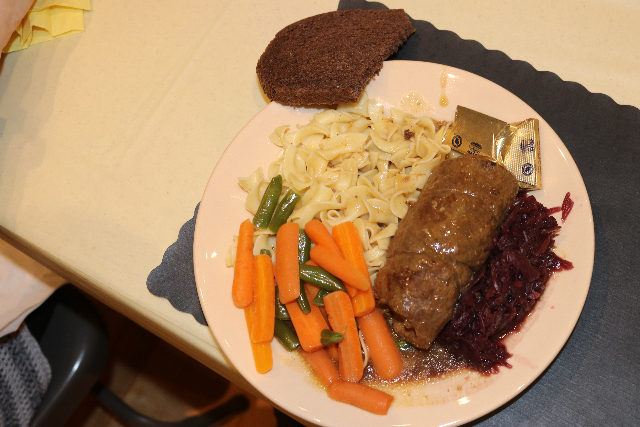 For just $12 there was a traditional feast of hand rolled, beef rouladen with red cabbage, noodles, and a vegetable medley. That ended with delicious Black Forest cake. We met early at their house to share a fine bottle of boutique Italian red wine. Phil discussed the unique grapes and what was distinctly Italian and regional about the 2013 vintage. 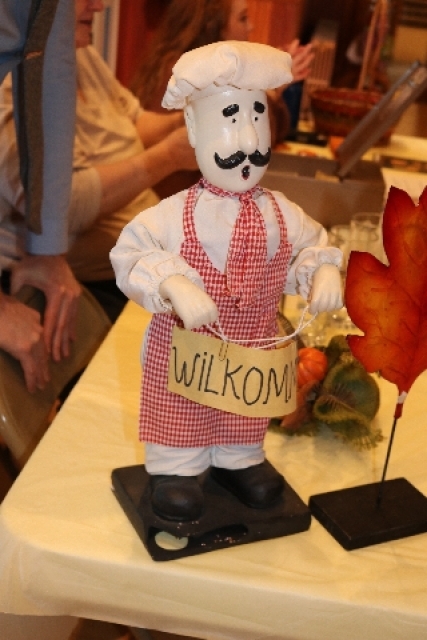 They filled us in on recent adventures in Portugal, and his upcoming trip to Verona. He is back for a bit and then they are off to Ireland. During a week of tasting in Portugal, sponsored by an airline, they sampled 600 wines. The task was to judge and select what is served to first class travelers. That entailed a commute from Lisbon to Prague. We recapped the summer season for which Maria covered theatre and Phil wrote about popular music at Tanglewood. Now that the madness is behind us we have more time for our friends when they are not globe-trotting. 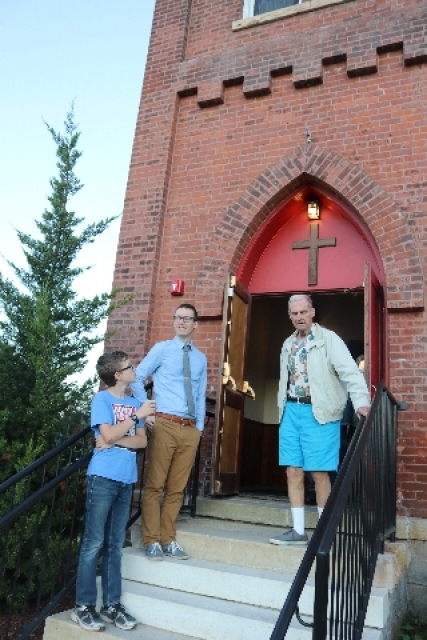 I insisted that we get to the church at the announced 5 PM starting time. 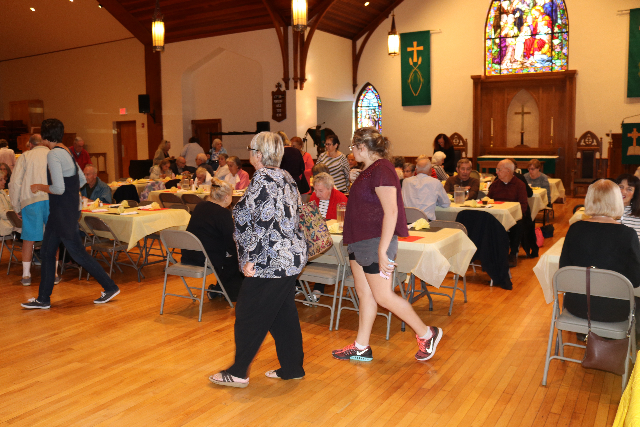 When we arrived the hall was already fairly full and there was a line for food. 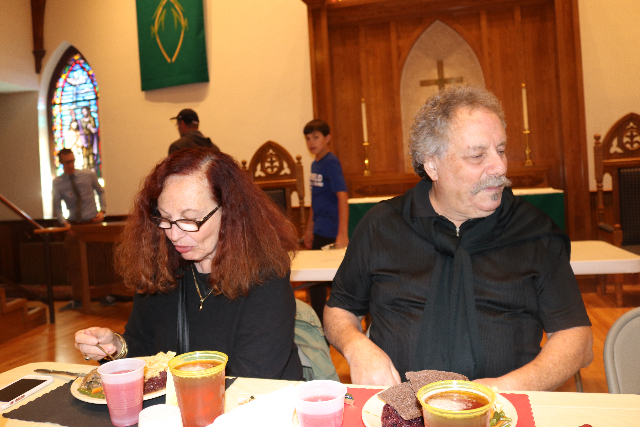 By the time we sat down with our delicious meal the queue snaked out the door. 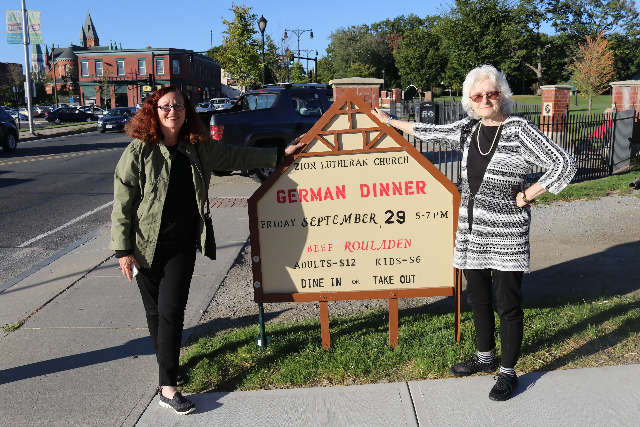 Amazingly, two German-born women had prepared the entire meal. 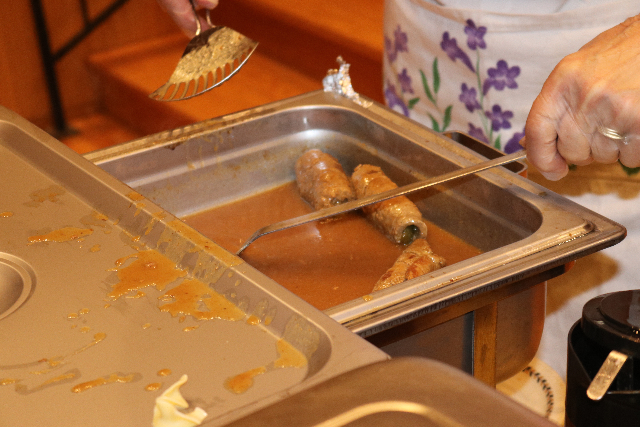 Consider that each serving of rouladen was hand rolled. Yum! There were 180 advance tickets as well as walkups. 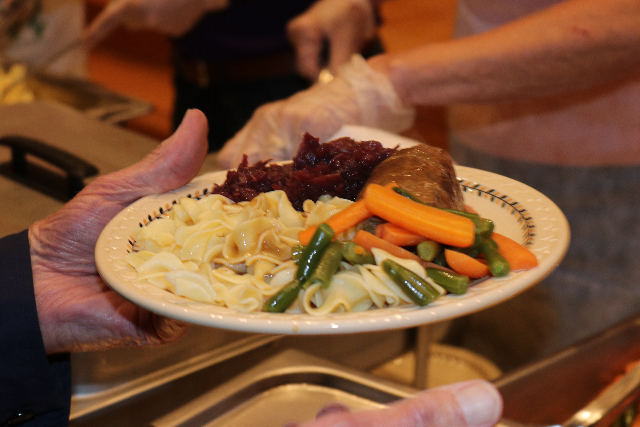 They prepared 240 portions so there was lots of food. 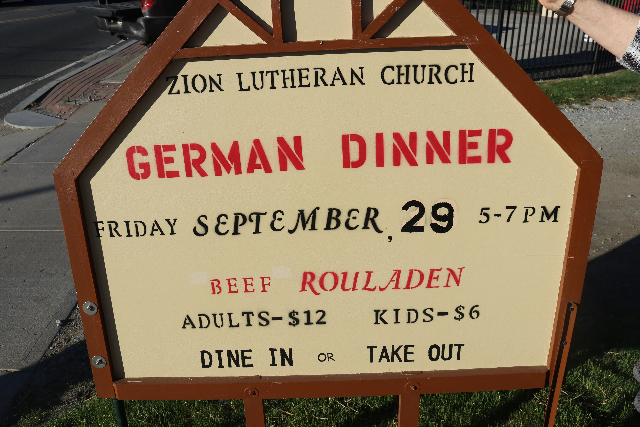 Of course Astrid had enjoyed rouladen many times growing up in Hamburg. Friends had brought it for us so I was familiar with the dish. 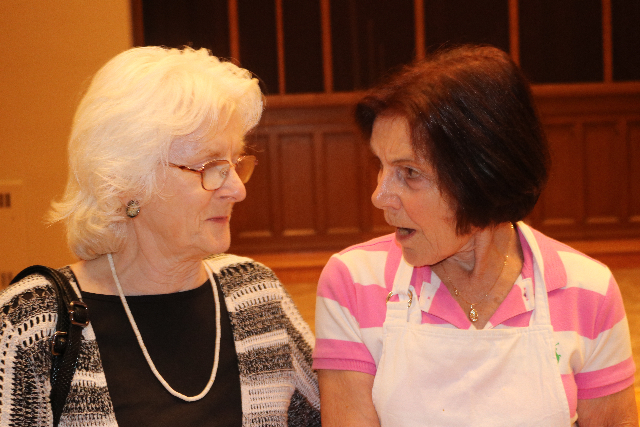 Talking about the recipe with Astrid it seems that a pickle is essential in the roll of meat. 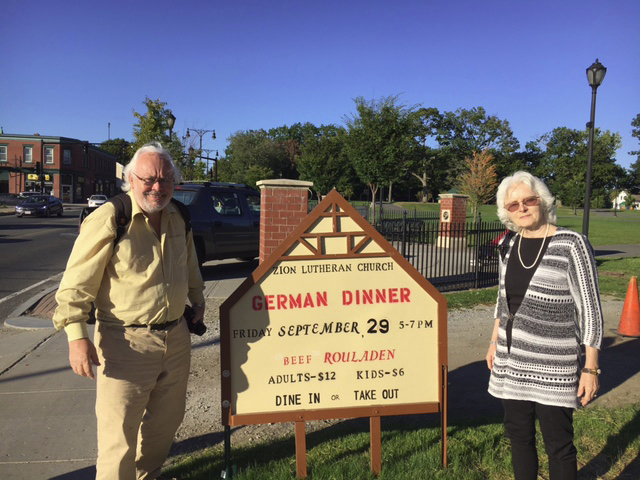 When the line slowed down, before we left, she chatted about German cuisine with the remarkable and dedicated cook. It seems that she had grown up in Lunenburg a small town near Hamburg. She visited 60 years ago and never left. I recalled visiting Lunenburg when we toured Nova Scotia some years ago. Phil and I looked at the wine but opted for beer. 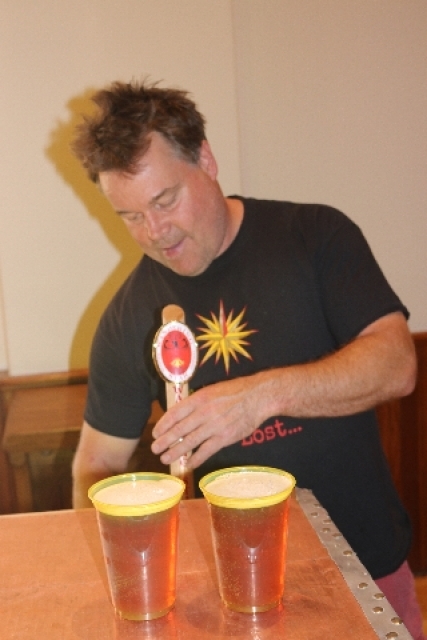 A hoppy IPA was poured by a local brewmaster. 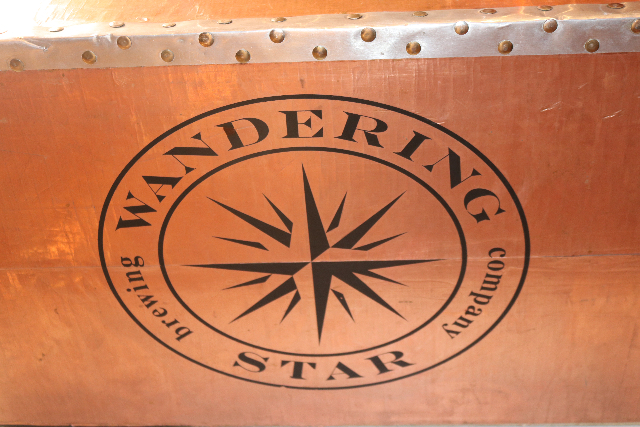 He told us “I just filtered it before coming here.” His brewery Wandering Star is a short distance from the church. 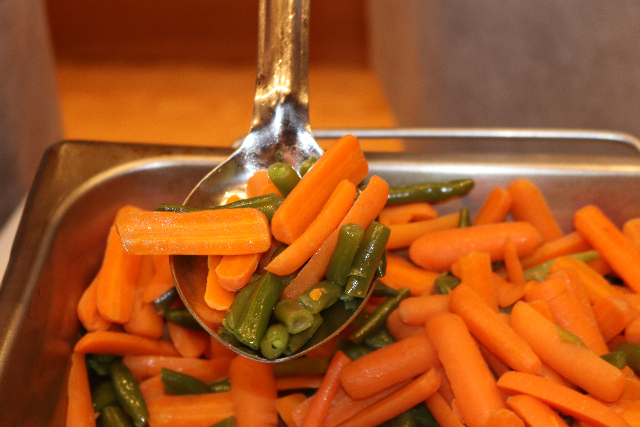 It was super fresh and zesty. Also Phil sampled a German white wine which he pronounced to be quite good. Not having been to church in some time I was pleased and surprised to have such a fun evening. With more diners streaming in we cleared and offered our seats. Anything is OK as long as you’re not a Papist. Back in the day I read and much enjoyed the spirit and critical thinking of Martin Luther. In particular, I vividly recall Babylonian Captivity of the Church and Letter to the German Princes. In hiding from the Pope he translated the Bible into German which was published by Guttenberg. Much of his writing, then and now, makes perfect sense to me. 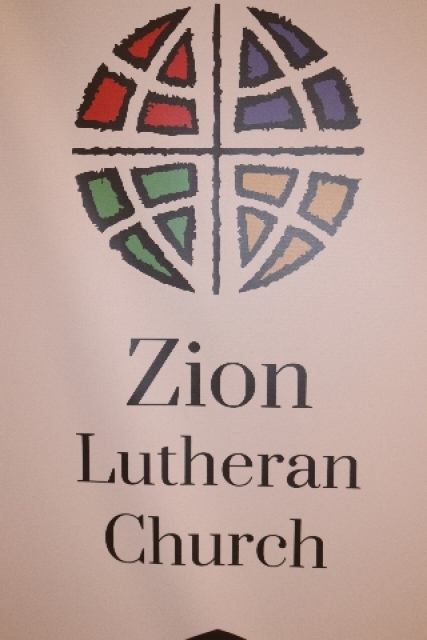 Were I not a committed heretic I might well be a Lutheran. 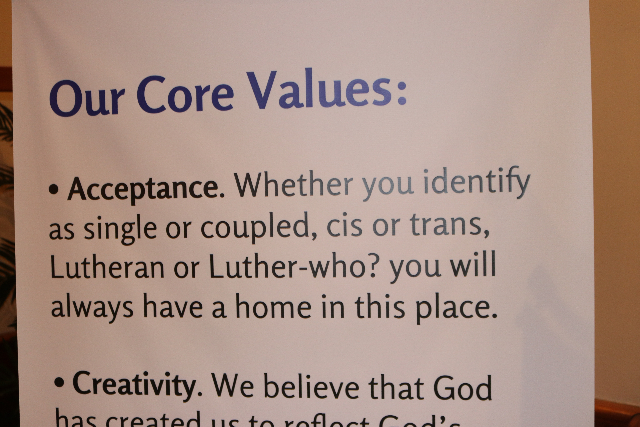 There were signs in the church that stated that everyone was welcome. By that I mean Everyone. 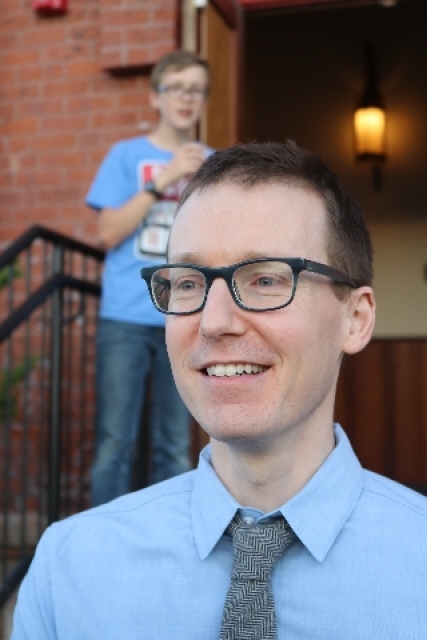 While leaving young Pastor Tim was on the church steps thanking us for coming. We’ll be back big time for sure.